Bulgaria will always surprise you – no matter how much you think you know. I have developed the dangerous smugness of an old Bulgaria-hand. I know how to use a bus. You need a ticket for each journey and you need to perforate it one of the unobtrusive perforating machines that line the inside of the bus. Then for the length of the journey, you must resist the temptation to screw the ticket up and use it to clean your ears. There is always a possibility that a ticket inspector will appear and demand to see your ticket and check its unique perforation. Visitors arriving at Sofia Central Station will find no notices in the main foreign languages beside the central bus stops to help them. They may assume (wrongly) that tickets will be sold on the bus. Those blessed with a little Bulgarian willl discover that tickets can be bought at the nearby kiosk. They cost one lev each but if you buy a block of ten there is a discount, enabling you to make ten separate journeys for 7 levs 50. Even unsuspecting Bulgarians may not be aware of a number of small but significant rules that are printed in small Cyrilic type on the last ticket. First the tickets are numbered and must be used in ascending order. Passengers must be ready to show not just the perforated ticket but also the remaining unused tickets to an inspector to prove that they have not bought the ticket on the black market from an enterprising ticket tout. The second rule is fatal in its unpredictability. Foreign tourists are rarely single. They often come in pairs. So imagine you are a couple and you have bought a block of ten tickets – calculating that this will give you five journeys to and from the main tourist sites. On the third journey an inspector looms into view. Dangerously confident you hand over your tickets. The inspector has had no training in dealing with foreigners so he begins to shout. If you are unlucky enough to understand a little Bulgarian, you will realise that one of you is an unauthorized passenger and must pay an on the spot fine. It is absolutely your fault that you failed to read the tiny Bulgarian print on the last ticket, that informs you that the block is to be used by one passenger only. It is the duty of every citizen of the world to read the small print on the back of bus tickets. On this occasion I made the fatal mistake of revealing that i understood Bulgarian. Retelling this story I heard how someone had witnessed a similar scene recently. The Inspector had shouted at uncomprehending tourists and amazingly this had led to such a threatening revolt by the other passengers that the Inspector had to retire in confusion to get off at the next stop and immediately join the Attacka party. At the excellent Hotel Metropolitan I received a letter from the mayor of Sofia, Bate Boyko, welcoming me to his city. I would like to challenge him to explain the absurd public transport system in a way that every foreign visitor will understand. The DSK is not the only institution where satirical remarks are banned. A short narrow corridor on the second floor of a council building is filled with a crowd of patient folk. No-one is even sure who is the last in line. Everyone is here to register ownership of land, house or apartment so that they can pay the local Amenities tax. There are just two chairs, a table to fill out the seven page form and a closed door to the office where behind just two of the nine available windows council workers serve the public. Everyone is amazingly patient, swopping stories of queues they have known. The only grudging note of complaint is that given they are taking money off us we might have expected a slightly better environment. An available toilet might help given the long wait – but the door to the Staff toilet is locked. The form poses interesting questions about our flat including details about the way it was built – was it panel, brick or the alarmingly named pulzyasht kofrage that in my dictionary translates as crawling falsework. An hour passes and we are at last admitted to the inner sanctum. At window number 1 a woman checks our form and of course spots much to criticise. Corrections made we are directed to next available window. Window number 6 has a notice informing us that the window does not work with clients. This is just as well because behind the window there is nobody. Behind Window number 7 a woman is sitting, avoiding eye contact. We take our form to her. She is angry – and rightly so! – she hasn’t invited us to her window and she is busy! Woman number 1 points us to the untenanted window number 2. I wonder out loud whether I should offer to move the notice about not working with clients from window number 6 to window number 7. I am worried that the paper shortage in Bulgaria has resulted in there being insufficient notices for the non operative windows. At this point woman number 1 sharply calls for silence. My comments are inconducive to the smooth working of the office. A new woman appears complaing loudly that some member of the public has managed to enter the staff toilets. Her comments pass without any reaction from woman number 1. They clearly fall into the category of constructive criticism. Woman number 2 at last appears. She is used to dealing with imbeciles and patiently explains all the mistakes we have made in filling out the form. Finally we are registered to pay tax. I take my hat off to the Bulgarian education system. Very few English people could have coped with a form of such detailed complexity. In the UK even a two page passport form requires posters, information campaigns and help from specially trained Post Office counsellors. What can I say? When you descend the stairs to sit on the couch, you lose all sense of time. The words came – including uhazhvane. I was swept along on a sense of verbal euphoria and then the great man was winding it up. I had to interrupt him to get my book on the screen. Kakvo nahalstvo ot moya strana! Many thanks to my adash for his support. It was a learning experience and a half. Many thanks too to Misho Vulkanov and the superb service laid on at the Metropolitan Hotel Sofia that helped me feel so amazingly relaxed on the show. I have never felt so pampered. The breakfast had to be seen to be believed. The Staff were extremely helpful and able to talk in a variety of languages. The decor was stunning. I particularly liked the light features by the lift on every floor and those in the bedrooms. 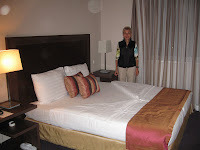 The furnishings and equipment of the rooms reflected great taste, care and intelligence. Many thanks too to Misho, Gosho and Dore Vulkanovi, Mimi Milanova and Joro Kostov who provided such support and especially Annie who looked so beautiful on screen.